Homeschool parent Hilary Cohen describes homeschooling her children with skills all over the range! Many of our brightest and most creative minds are not only going unrecognized, but they also are often given diagnoses that indicate pathology. By James T. Webb, et al. Susan Baum writes: How can a child learn and not learn at the same time? You may find yourself asking, “Is my child just a little quirky, or are we looking at the possibility of Asperger’s Syndrome, ADHD, mental disorders, dyslexia, visual or auditory processing disorders…? By Corin Barsily Goodwin. Everyone listed here was referred by GHF staff or members on the basis of good service, an understanding of giftedness, and an open mind regarding alternative forms of education. Let’s talk about the g-word: gifted. It’s an uncomfortable word, is it not? The word gift implies that the child has been given something extra, that they have a leg up over other children. It leaves out the concept of giftedness as asynchrony, which I believe is the key to changing the public’s understanding of this population. By Cait Fitz, My Little Poppies. By Elisabeth Hallett. “Not making the cut for Talent Pool may be your child’s first experience of failure,” an informational booklet advises us, adding some bland suggestions for helping a child cope with disappointment and the reality of a competitive world. No child can be more exhilarating, or more frustrating than the gifted child. Parents and teachers who deal with these wonderful children can often be described in a single word: Exhausted. Suzy, on Hoagies’ Page, talks bluntly about her fears over homeschooling a willful child, and concerns over being entirely responsible and patient all the time. I have to remind myself that what my son is doing is significant (even with the gaps) and that he will find his own way. His path may be different and atypical but it is also unique and meaningful. He is creative and productive and confident and happy. And in the end isn’t that all that matters? After a decade of helping more than 1650 parents homeschool their children with learning disabilities, Sandy Cook has compiled the most frequently asked questions about homeschooling a learning abled kid. 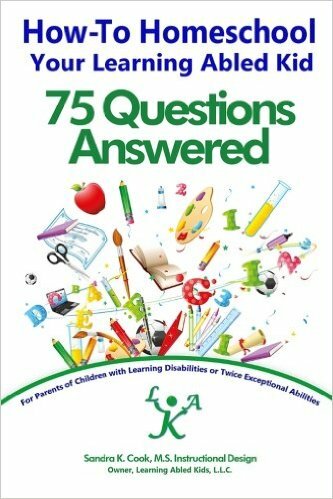 This handy reference guide will answer many of your questions without you ever feeling like you’re asking “too many questions.” If you don’t know any other homeschoolers, this book is essential for giving you insights about everything from getting started to finding other homeschooling families and how to choose curriculum for your child. By Sally Carless. Who are the Indigo children? How do you know if your child is one? And if they are–or if you’re not sure, but you know that their current schooling situation is not working for them–what do you do about it? A cheetah metaphor can help us see the problem with achievement-oriented thinking. By Stephanie S. Tolan. Are you homeschooling a bright child who happens to have a learning disability? As you know, teaching and learning can be a significant challenge for both you and your child. I explained to the school that Colleen was gifted and also had a learning disability called dysgraphia. Their response? “Oh no, it’s against district policy to be both. You’ll have to choose one or the other.” By Terrie Lynn Bittner. Many gifted and talented children (and adults) are being misdiagnosed by psychologists, psychiatrists, pediatricians, and other health care professionals. By James T. Webb, Ph.D. It is helpful to conceptualize needs of gifted children in terms of those that arise because of the interaction with the environmental setting (e.g., family, school, or cultural milieu) and those that arise internally because of the very characteristics of the gifted child. I brought a notebook with me to the theater, and I found myself wildly taking notes during some of the best scenes of the movie. I kept thinking about all the incredible potential conversations that could come up within families after viewing this movie together. By Bob Yamtich. Watch Big Hero 6 instantly.